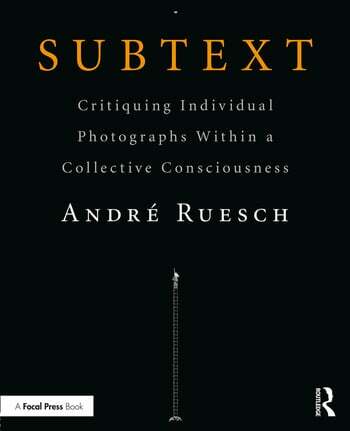 Subtext invites and encourages personal and blatantly subjective responses to photographs and analyzes the drivers behind them. During decades of participating in critiques as both student and teacher, André Ruesch has become convinced that it is the personal response to work that connects us in the most visceral and meaningful way. This book aims to encourage and educate viewers how to read and understand photographs on a deeper level, honoring and validating their responses to photographs. This book seeks to vitalize students in the photography classroom. Rather than a dense tome of theory, this is an accessible guide to taking individual ownership of—and enjoying—the visual experience. To be visually literate is comparable to being linguistically literate. Such literacy is necessary to engender a deeper understanding and valuation of culture: both types of literacy create, enrich, define and historically document the expression of one individual to be shared by all. André Ruesch has been an active photographer for over thirty years. After receiving a BA in photographic studies at Edinburgh Napier University, Scotland, he moved to Albuquerque to receive his MA and MFA for graduate studies in photography at the University of New Mexico. While there, his main mentors were Patrick Nagatani, Betty Hahn, and Eugenia Parry. Ruesch’s work has been internationally exhibited in museums and galleries and published in the British Journal of Photography, Art in America, and Asian Art News among others. He lives in Massachusetts, where he is a Professor at the Lesley University College of Art and Design & the College of Liberal Arts and Sciences.